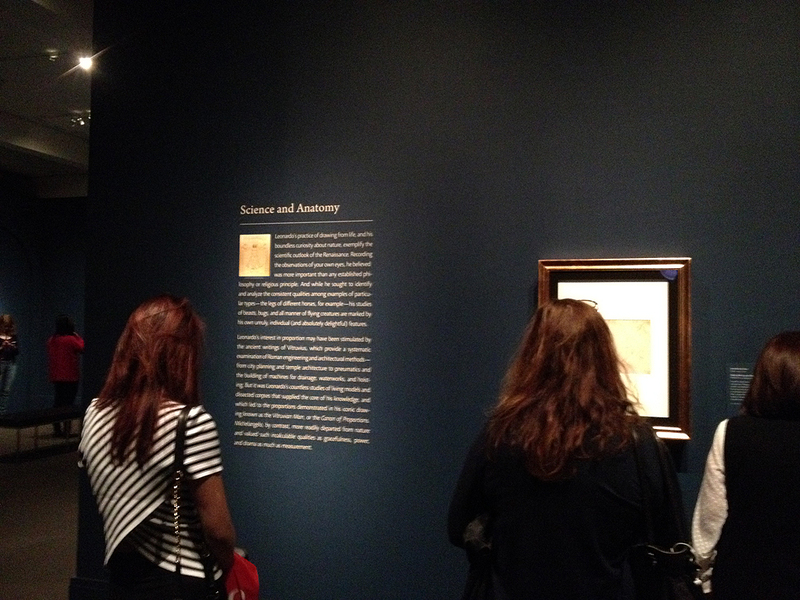 We went to the Museum of Fine Arts, Boston to see their new Leonardo Da Vinci exhibit last Friday afternoon. 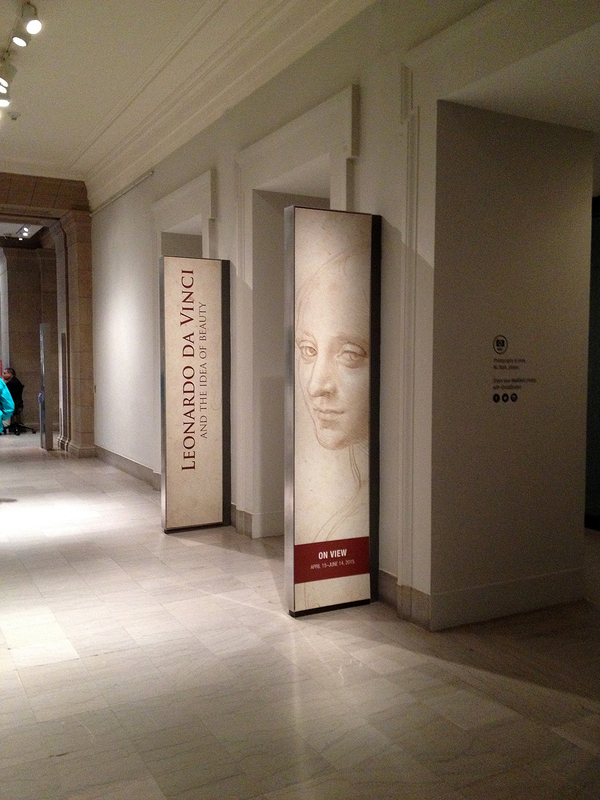 As a big Da Vinci fan, the folks here were tickled that they were going to see some of his sketches in person! Actually, “tickled” may be understating it. This exhibit may be the coolest we have ever seen at the Museum…and the MFA has a LOT of cool stuff!!! You will see why we make this claim later in the article. 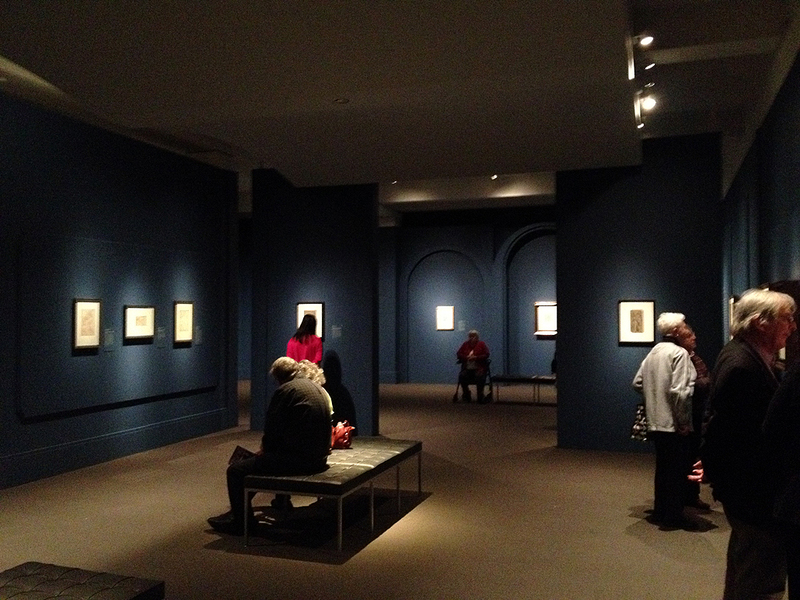 The MFA’s Leonardo da Vinci and the Idea of Beauty features a number of highly admired drawings by Leonardo. The exhibition, organized by the Muscarelle Museum of Art in Turin, Italy, explores the artist’s concept of ideal beauty through 30 drawings and manuscripts by Leonardo, Michelangelo, and their followers. Leonardo’s works represent the culmination of the early Renaissance idea of beauty, and reflect his view that ideal beauty could be observed by study of the most perfect human features. He was the consummate Renaissance Man: painter of “Mona Lisa” as well as scientist, designing flying machines and studying anatomy in intricate detail. Dedicated to Leonardo’s artistic style and philosophy, the exhibition is organized into three sections: “Idea of Beauty” which includes old age and youth; “Divine and Worldly Beauty;” and “Science and Anatomy.” Every decade in Leonardo’s career is represented, as well as his influence on his pupils—known as the Leonardeschi—and his greatest rival, Michelangelo. OK…couldn’t pass on the pretty face. This is a drawing by Giovanni Antionio Boltraffio called “Head of a Youth with an Ivy Wreath.” Boltranffio was a student of Da Vinci’s. What is interesting about this metal point sketch is the study of proportions (space between the eyes, the position of the nose, etc). It is unclear whether the subject is male or female…not that it matters. While Da Vinci is famous for his “Mona Lisa” and “The Last Supper” paintings, it is his work on human anatomy that many of us find more fascinating. 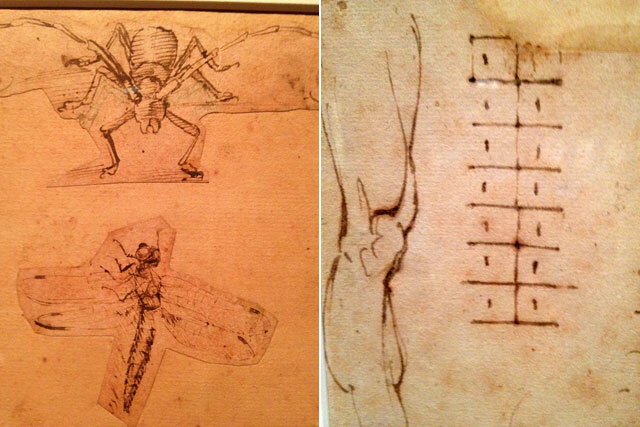 His sketches, made over 500 years ago, were so good that heart surgeons are still learning from them today. If they had been published before he died instead of being forgotten for 400 years, medicine may have made much greater strides forward much earlier. While the heart anatomical sketches are not in this exhibit, sketches of insects, animals and other body parts are. Yes, there are lots of great sketches of faces and such, but the section of most interest for us are the anatomical studies (dissections, 3D cross sections, etc.). It’s incredible to think that Da Vinci worked in 3D slices centuries before the MRI!!! Also in the exhibit was The Codex on the Flight of Birds (about 1505). 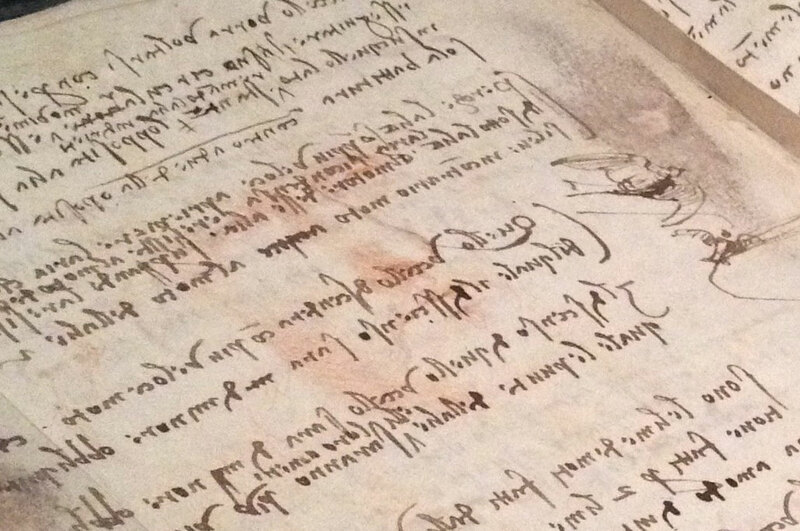 The ACTUAL Da Vinci’s codex on flight…WOW!!! The codex contains Da Vinci’s studies on the flight behavior of birds from which many of his mechanisms/machines for flight were based. Leonardo actually built a number of these contraptions, but all attempts to get them into the air failed. It is not that his designs were flawed (although some may be), but that the strength-to-weight ratio of the materials he had available were not sufficient for his needs. PBS had a fascinating documentary which followed a group of enthusiasts in the UK as they try to build—and fly—one of his machines. OK…remember earlier that we said this exhibit was the “coolest we have ever seen at the Museum?” Well, the following is why. This amazing loan from the Biblioteca Reale in Turin features a newly discovered self-portrait of Leonardo!!! The partially hidden drawing, depicting the artist at age 50, was identified only five years ago. The discovery was made in 2009 by a team of Italian journalists, imaging technicians, and facial surgeons. The work went unnoticed within the codex for centuries because it was kind of obscured by the lines of text that ran across it. The image was made more visible when it was extracted with digital image processing. 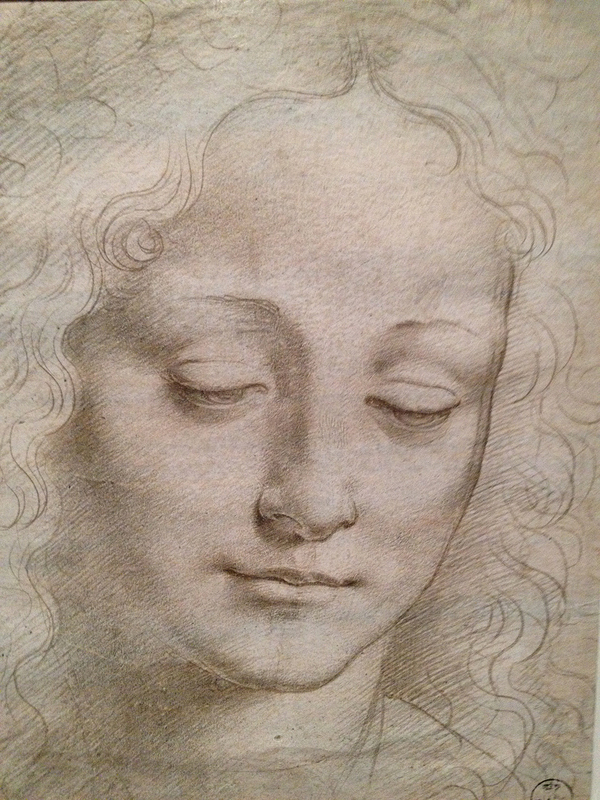 The face, when isolated from the writing, is a lot like the famous drawing in the Biblioteca Reale’s collection (image below right), long believed to be that of a much older Da Vinci. OK, the sketch MAY be a self-portrait, but it may also be of how Leonardo thinks he would appear when he was a bit older. How incredibly cool is that??? The MFA exhibit will be there until June 14th…go and see it if you can. It is more than amazing, it is inspiring!!! 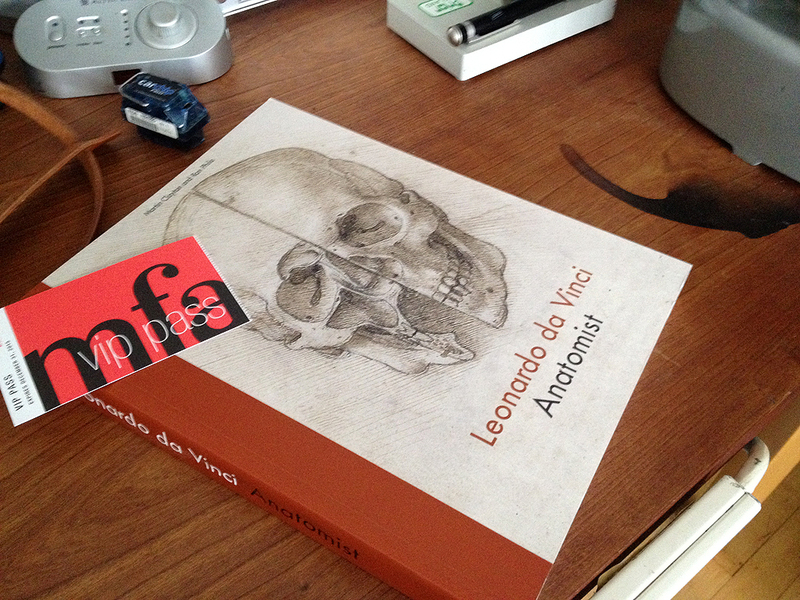 And if you are looking to add to your Da Vinci book collection, check out the MFA gift shop. We added this new book to our Da Vinci library. NOTE: BTW…the reason why all images were a bit fuzzy was because, in our excitement, we forgot to bring a regular camera and had to use our iPhone 4S!! !